The Fishy Business by Maxwell Eaton III, a Mysterious Review. 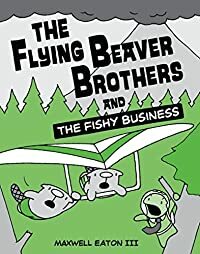 Review: A mysterious volcano has suddenly appeared off the coast of Beaver Island, prompting the brothers to investigate in The Fishy Business, the second graphic adventure in this series by Maxwell Eaton III. If the previous — and first — book in this series, The Evil Penguin Plan, may have been too subtle in its message about the possible consequences of global climate change, quite the opposite is true here: the solution to saving the environment is to destroy the capitalist infrastructure that exploits it. Though clearly intended as broad farce, promoting excessive violence against those interests one opposes seems inappropriate for a children's book when several different, more constructive and, quite frankly, more eco-friendly approaches could readily have been used. Other elements of The Fishy Business are far more entertaining. Gentle fun is poked at the marketing of Fish Stix, from the confusion as to what the product really is — it apparently has no useful function — to the filming of an infomercial extolling the virtues of its environmental friendliness with, of course, the obligatory disclaimer legalese taking up an entire page. There is so much humor in this book that it is unfortunate the author chose to make a point about very real risks to the environment by including a most disturbing scenario to deal with one of them. Acknowledgment: Random House provided a copy of The Fishy Business for this review.